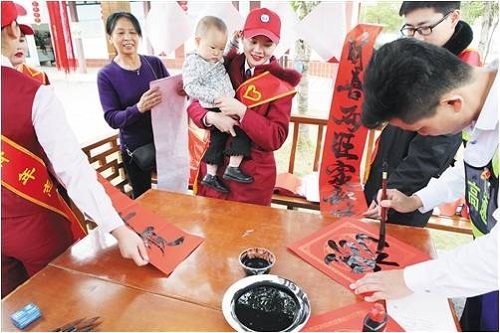 Recently, Nanning Expressway Operation Co., Ltd. launched a Spring Festival transport service activity themed with “Heart-warming Expressway for Going Home with Love” within its jurisdiction such as Lingli, Dongshan and Wuming, which sent blessings and comfortable Spring Festival transport service to the drivers and passengers on their way home. All service areas carried out a heart-warming activity for the passing drivers and passengers on that very day. The traffic laws and regulations and safety knowledge were widely publicized by distributing publicity materials on site such as travel routes and safe travel knowledge, playing traffic safety warning videos and presenting traffic safety and convenient articles. Meanwhile, some items including guessing lantern riddle, and sending “Fu (blessings)” and couplets made the staff experience the warm and intimate highway service on the way home.